The son of Mexican farmworkers, Philosophy Professor Carlos Alberto Sánchez, ’98 Advertising, ’00 MA Philosophy, grew up in California’s central valley. Though his parents risked everything to create a new life for him and his siblings, it wasn’t until a high school counselor urged him to apply to San Jose State that he realized that a career in academia was a possibility. 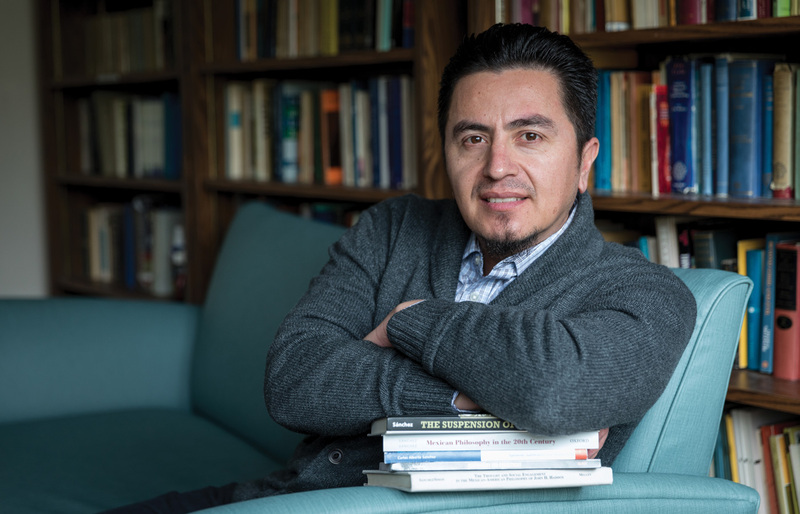 Philosophy offered ways for him to explore what he calls the “post-immigrant identity,” introduce Mexican philosophers to a global audience and create a space for Mexican-American academicians. Twenty years after completing his undergraduate degree at SJSU, Sánchez has been awarded the 2018 President’s Scholar Award. Since returning to his alma mater to teach in 2006, Sánchez has published five books, 25 articles and many conference papers. While writing his first book, The Suspension of Seriousness: On the Phenomenology of Jorge Portilla, the first authorized English translation of Portilla’s work, he visited libraries in Mexico City and presented at conferences all over North America. By translating and analyzing the work of Mexican philosophers, Sánchez is effectively democratizing access to critical thought. The President’s Scholar Award recognizes a faculty member who has achieved widespread recognition based on the quality of scholarship, performance or creative activities. This year’s winner comes from the College of Humanities and the Arts. He will be honored at the 19th Annual Faculty Service Recognition and Awards Luncheon on April 5, 2018. Tickets are available for purchase. Tight. Great person right here.